Salvequick Pilferproof Plastic Plasters are convenient, high-quality sterile adhesive bandages. 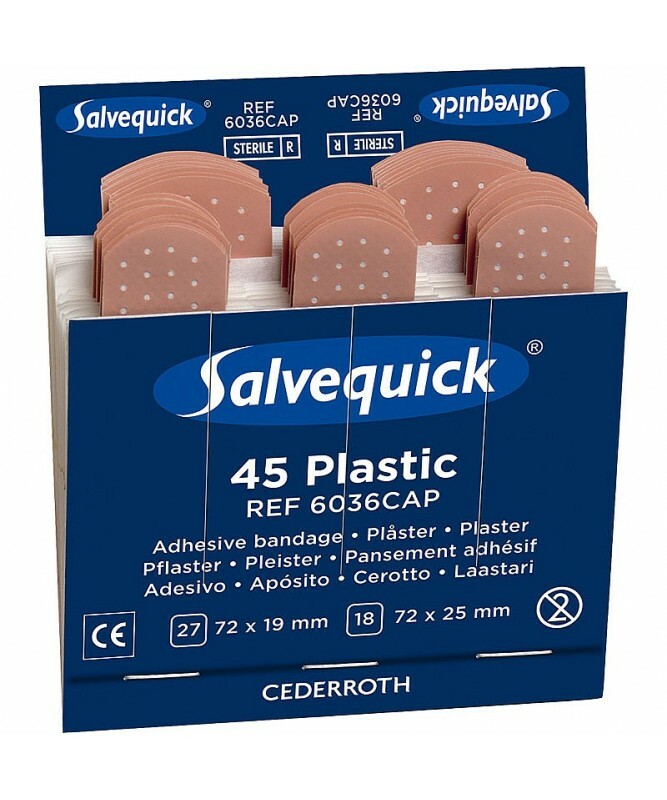 These plasters are allergy tested and are ideal for use with the Salvequick Pilferproof Plaster Dispenser. This dispenser allows you to pull plasters downwards, which avoids you getting dirt or blood on any other plasters as well as apply the plaster with only one hand. When you pull a Salvequick plaster out the dispenser, one side is uncovered, making the plaster ready to use. The hygienic door keeps plasters clean and fresh, and makes it easy to see when you need to fill up with new plasters. This pack of plaster refills lock into the dispenser securely. There are 45 sterile plasters included: 27 smaller 7.2 x 1.9cm size, and 18 larger 7.2 x 2.5cm size.